Mid walk change of plan, instead of stopping at Autrans, I carried on walking to Grenoble. The point of no return was 3.30 in the afternoon when I had to turn in the wrong direction to Autrans, which was about 90 minutes away, or carry on in the right direction to Grenoble, which was about 5 hours away. Going backwards was more painful than going forwards so I went to Grenoble. Took me a bit longer than I had hoped after getting lost at St-Nizier but I got to Grenoble just after 9. Walking for 13 and a half hours, 2300 metres of climb and 43 kilometres, sore feet but no permanent damage. Got away from la Balme de Rencurel by 7.30. The hotel gave me an early breakfast and the biggest sandwich so far, had everything in it including little gerkins, top sandwich award. The weather was OK but looking up the valley it was cloudy. Just like at la Vacherie, three days ago, when the wind is from the north the clouds seem to hang on the tops of the mountains. Looking south the views were great. 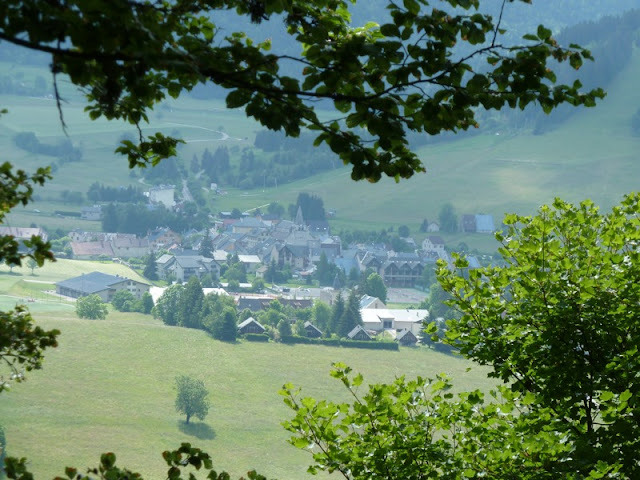 Steady climb up the Rencurel valley and then a short tough ascent over the ridge into the Autrans valley. As soon as you got above 1300 metres the views disappeared in the mist. I was on outskirts of Autran, looking across a sunny valley by about 11.30. Motivation was a bit difficult at this point. The plan involved walking around this huge semi-circle, which was probably going to be in the cloud, only to come back to a point I had got to mid-morning. Anyway I pressed on climbing up through trees and after about 90 minutes my fears were confirmed. 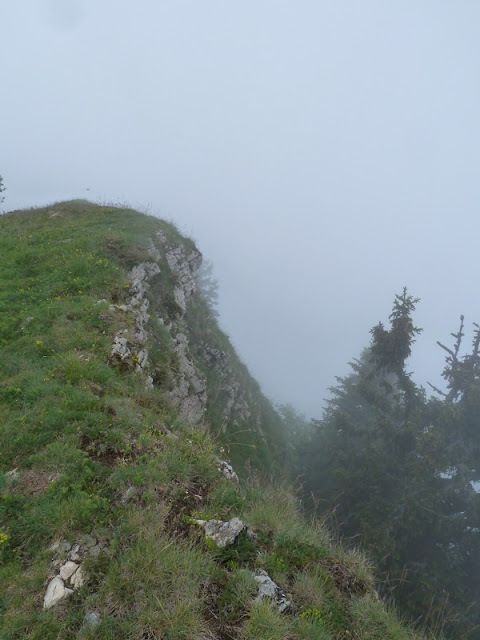 I was standing on a ridge, at the Signal de Nave, out of the trees but looking into the mist. No choice but to carry on around stopping periodically to commiserate with other walkers sitting at the frequent view points staring into the cloud. Not only couldn't I see it was also hard work as it was far from flat, with a series of mini peaks all around to the loop. 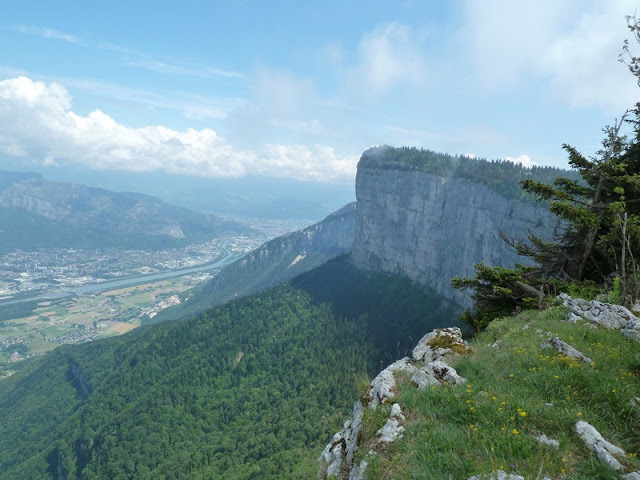 It then started to clear and for the last third of the ridge I got some amazing views: looking back along the ridge with it's huge cliffs; into the Isere valley with Grenoble looking deceptively close; and across the valley to the Chartreuse, the next stage of the walk. I blame the improvement in the weather for the decision to carry on. After walking in the clouds it was now just so nice that I didn't really want to end the walk going in the wrong direction. I could see Grenoble and, despite the fact that the route went in the opposite direction, my optimistic streak was unconsciously telling me it would be easy. Going away from Grenoble meant going to St-Nizier, which meant going down to Engins and then back up and then climbing over an incredibly steep cliff (featured in the picture below). I would have stopped at St-Nizier if I could have found some accommodation but as it was I just got lost. Was in too much of a hurry to check the map and the route has changed. At one point I was heading along a bit of the GR9 in the wrong direction. Anyway I eventually found a route down and after 600 metres of descent was in the suburbs of Grenoble. After such a day the hard surfaces were very painful but I made it to somewhere near the middle, found a cheap hotel, got showered and went out and bought a pizza. What treats. Have now got three days without walking, so no blogging until Saturday. Staying with a friend about a hours train journey from Grenoble and then back again on Saturday to start 10 days of walking to the Swiss border. Enjoy that hospitality, John, you deserve it! 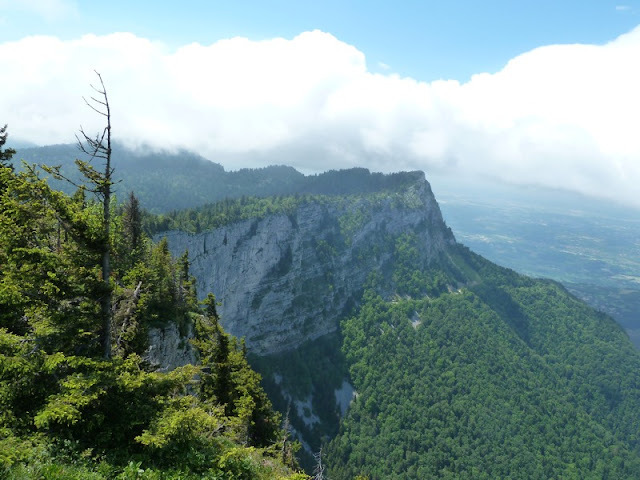 Having finished with the Vercors, you will certainly understand why the Nazis and their friends in Vichy never got hold of this part of France during World War II. 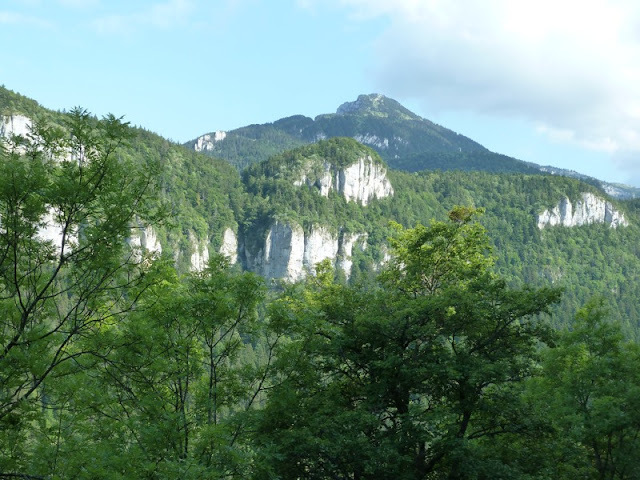 The Vercors is just too rough and tough to keep unless you are born there and know it very well. The region became one of the highlights of French Resistance. How is Grenoble, by the way? I remember it as a beautiful city under a thick layer of smog, but maybe the air has cleared up since then.